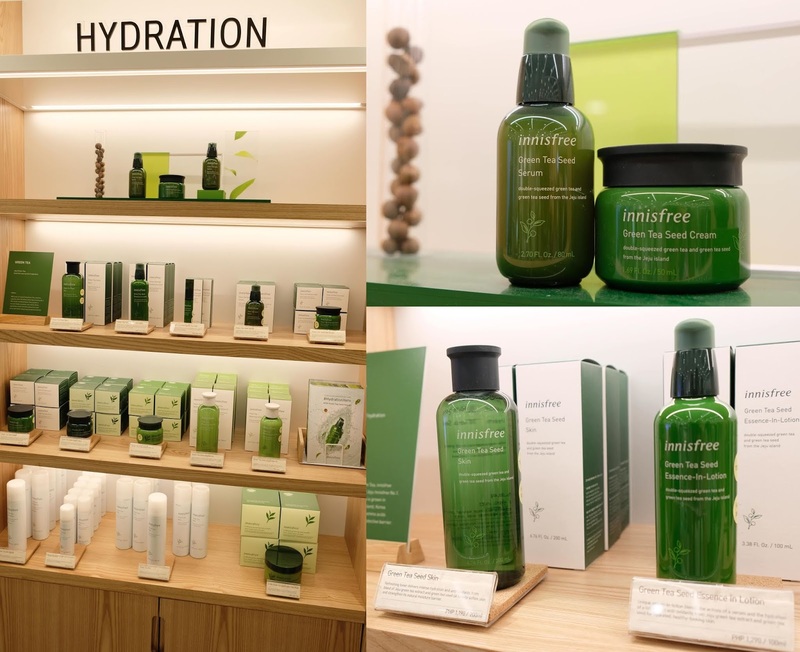 When Innisfree opens its' first store in the Philippines at SM Mall of Asia, I loved the experience so much I wrote a Guide to Shopping at Innisfree SM Mall of Asia branch. When I got another invite to visit the brand's 2nd store located at SM Megamall A, I knew I had to be there and check out the newest store and see what they have to offer. For some reason, the interior of both stores have the same organized feel that I super love! 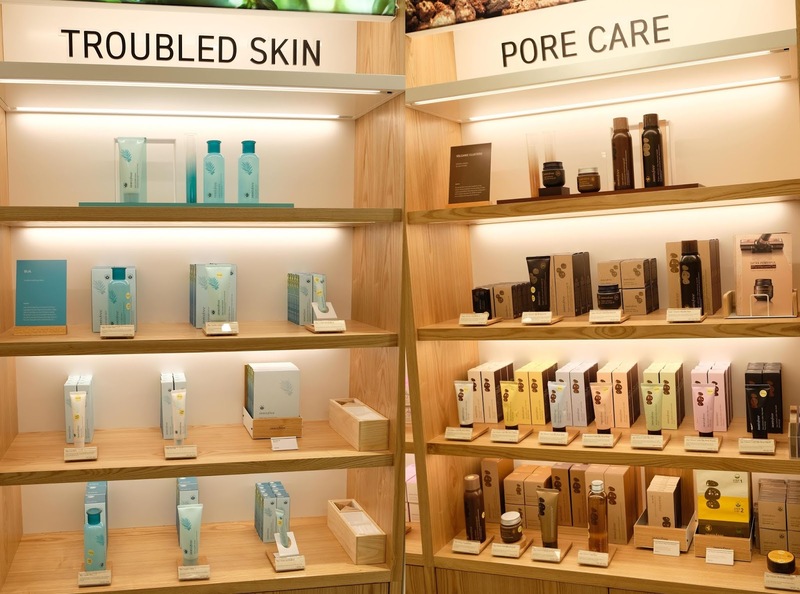 Same as the SM MOA branch, you will be greeted with a categorized display of skincare and makeup items! Overwhelming? YES, but you won't get lost if you check out my guide and guess what? I have more tips today! Before the tips, I will be sharing to you a quick overview of the 2nd store. 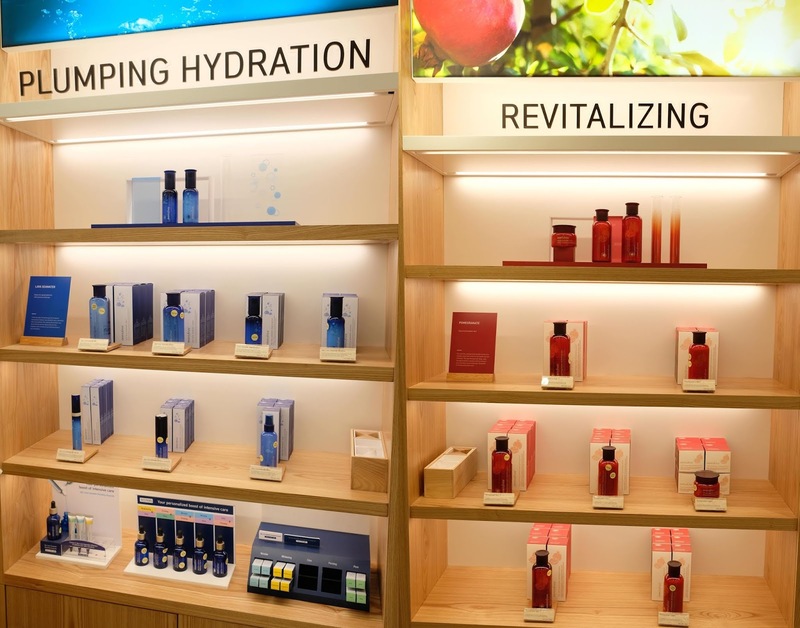 Everyone needs to cleanse their face, the 2 display is a perfect area for you to jumpstart your skincare products shopping! Body products is the easiest item to purchase whether you plan to gift yourself one or gift to others! I love "My Perfumed Body" section. This is the area where you will get to appreciate the various scents from the brand - trust me, they are NOT overwhelming at all so you don't need to sniff on coffee beans! A favorite section of mine, again, EVERYONE washes their hair so this is a MUST section to visit. I am in love with their different variants of hair products catering various hair concerns - whether you have dry scalp, dry hair or even damaged hair, they've got different ranges on that! And if you are into skincare, Sun care should always be a regimen you can't live without! I love the Innisfree Sun care products - they contain high spf without the grease and best of all, they really work! As we all know, Korean skincare always includes face masks. If you visit any Korean Beauty store, you really must give their face masks or mask packs a try, why? Because masking is really like that of a "facial treatment" that you do at the comfort of your home! And obviously, if you go into Innisfree and you are aiming to up your makeup game! Innisfree maybe known as a skincare expert but you have to take a look at their WIDE range of makeup line! I find their makeup line to be so complete even Professional Make Up Artists can create various looks inside the store! From Cushion to liquid foundation, they have dark shades included here! I can't believe how big of a range they have for correctors! Who doesn't love the Innisfree Vivid Cotton Ink? for those who are just starting out on makeup! Includes blush and eyeshadow colors! And of course, the nail artist in me LOVES all the shades of nail polishes they offer. I love how they are well displayed making it easy for me to spot the shades I want to create different nail art designs! Best of all, they have testers so you can always try on different shades on your 10 fingernails! Now, if you want to "up" your skincare game, Innisfree has a WIDE range of skincare products focusing on different skin concerns and needs. The Green Tea Seed Serum line is the well known line of the brand because of the crazy hydration it gives! Wary to invest on products that may not work for you? brand new look! Innisfree has reinvented the rules of hydration with the NEW Green Tea Seed Serum. Packed with amino acid and minerals, this lightweight yet nourishing serum works to replenish your optimal moisture level, wrapping skin in comfort for a smooth, glowing complexion. It opens the moisture path of dehydrated skin to replenish clear moisture. The Innisfree’s best-seller, Green Tea Seed Serum retails for Php1,590, with 8 bottles sold every minute around the world. Once you tried their sample kit, you can always return and repurchase full-size of their best-selling items! You HAVE TO TRY the Green Tea Mist! I am in love with this product after giving this a try during the launch. Thankfully, they also offer this mist in various sizes making the small one a perfect travel partner especially on long-haul flights! Now, you finally made a purchase of their best-selling skincare items, now how to use them you say? Thankfully, I was lucky enough to attend a "Glass Skin Workshop" during the Pre-Opening with Innisfree Philippines' Trainer Ms. Jet Guison. Read further for the tips I learned during the event to create Glass Skin using Innisfree skincare products. According to Ms. Guison, the right way to cleanse is to "double cleanse". The first step should be with an oil-based cleanser as this will help remove oil-based makeup products. Using a water-based cleanser is the 2nd step to help wash off excess oil and dirt. Which comes first? Serum or Lotion? During the workshop, I learned that Innisfree Green Tea Seed Serum is actually a boosting serum. This is best used IMMEDIATELY after cleansing so Ms. Guison actually recommended us to leave the product inside your bathroom. The Green Tea Seed Serum is the first serum to be applied on your face and it is best to start at the forehead then to the cheeks, nose, chin and spread on entire face and neck. Innisfree calls this step "Skin". Why? According to Jet: "Everytime you wash your face, the acidity of the skin gets lowered making it prone to bacteria. This step will help balance the PH level of your skin." For this step, there are 2 types of products you can use depending on your skin type. If you have dry skin, the best product to use is the Innisfree Green Tea Balancing Skin as this product has a milky texture leaving your skin supple after application. If you have oily skin, you can opt for the Innisfree Green Tea Seed Skin. I used to be confused with Serums and Lotions, but after constant research and with the help of Ms. Jet, it was confirmed that Lotion can actually works as moisturizer. This type of moisturizer is actually perfect for our humid weather and it is effective in balancing the oil and hydration of your skin. Same as Jet, I highly recommend EVERYONE to moisturizer their skin no matter what skin type they're in! Innisfree has Seed Essence in Lotion which has a very lightweight texture and it gets absorbed into skin easily! This can work as your daily moisturizer especially if you dislike the heavy feel of most moisturizers you've tried. I have always been a fan of face mists and I'm glad Innisfree was able to create a face mist that does not only hydrate your skin but it smells extremely GOOD! Please, if you go into any of Innisfree stores, give these testers a try as they are really good! To finish off the glass skin effect, we really need a moisturizer that does not only hydrate your skin but soothes your skin from the harsh rays of the sun. The Innisfree Aloe Revital Soothing Gel contains 93% aloe (less than what we see in other brands) but we are assured that they are PURE and free from harmful ingredients. Now that we're done with skincare, we may need help from makeup to create that glass skin look. The Innisfree Cushion is a winner in terms of coverage - it looks very light upon swatch but it can help cover certain redness, undereye darkness even pimple marks and spots! This is hypoallergenic and helps create healthy-looking skin with a few dabbing motion. Lastly, what we love about Korean Glass Skin is how the lips look healthy as well. Innisfree have different shades of lip balms! Best of all, this is a multi-tasking product that can also be used as blush! I love how natural the lip balm look as a blush and it maintains that glowing skin without the oily-effect. Now of course, let me get back to a mini-store tour for you! You are not required to stick to the Green Tea Seed line just because this line is well-loved, in any quest for the best skincare products, you have to know and understand the needs of your skin! As for me, hydration is not only my issue but since I am not getting any younger, I would appreciate skincare products with anti-aging benefits to it! You can also find that inside Innisfree store and look for the Jeju Orchid Range. You can do the same skincare regimen to achieve Korean Glowing skin with these items from the said range! There's Plumping Hydrationg and Revitalizing section. Jeju Lava Seawater is known to give not only hydration but keeps your skin looking plump and young-looking. Pomegranate is best known to boost and revive your skin's texture. This range is perfect if you are aiming for brighter-looking skin. This section targets problematic skin. Volcanic Pore Clay Mask is one of their bestselling products well-loved not only by Koreans but also Filipinos! And other ranges like Olive Real Skin Care line has powerful moisturization for dry skin. Aside from that, it can help improve skin's suppleness and help create moisture barrier to keep moisture from leaving your skin! Now, if your skin is heeled from previous acne or zits, I highly recommend you give the Black Green Tea line a try! Black Green Tea line uses fermented real green tea leaves to help keep skin firmer and clearer. What made me proud to support Innisfree is not only for the fact that their products are good, I am proud to say that the brand supports cause that give back to the earth and the community. materials are then used in making new packaging or upcycled into new objects or art. Now you tell me, won't you just love to support such brand?